Last week we reported on the work that we were doing on the LBA array bandpasses. We had noted a few problems and have been looking into the cause of them. It turns out that some of the cables with joins did not have a correct ground shielding. The break in the shield occurs at this join location and is caused by resin from the water-proofing forming an insulator gap in the connector threads. To fix the problem, we need to very careful remove the housing and clean out the resin. The cable connectors can then be re-fitted and tested. 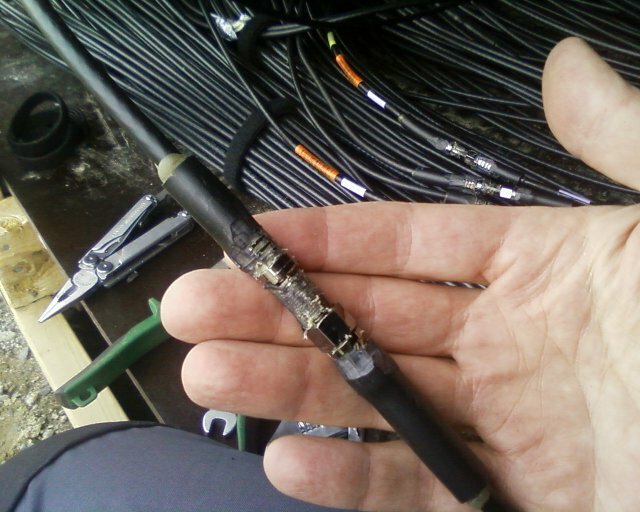 A cleaned and reconnected LBA cable join. Carrying out this work is extremely time-consuming. Each cable join is taking between 15-30 minutes to clean out and test. Still, it is important work, and it is essential in order to get the entire LBA operational.